As a follow-up to yesterday’s post on character animals for Fall 2011, today we bring you an extension of that trend. Animals were not the only conversation prints on the runways. In keeping with the digital prints trend that we have seen growing for the past couple of seasons, designers took to highlighting large black and white photograph inspired prints on garments. Although we did see some in color, most have been spotted in typical polaroid fashion. 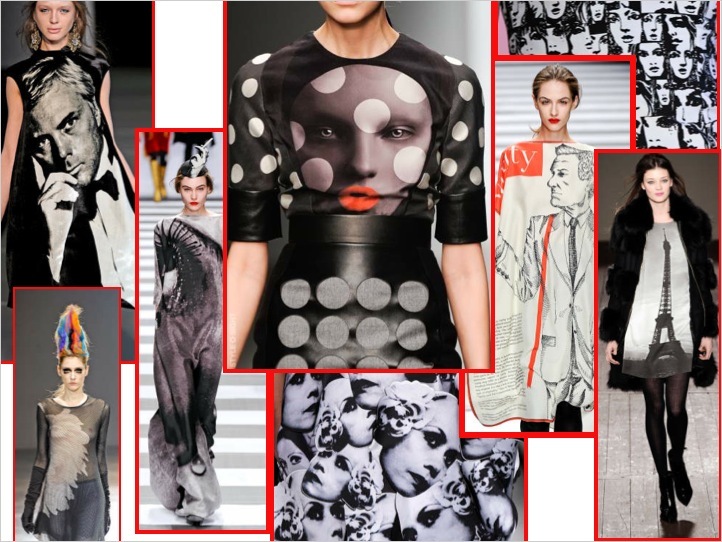 Look for digital and collaged assemblage as well as oversized and over-saturated prints. Placement is large sometimes taking the entire front of the garment while other times encompassing an entire print. Styles were seen in dresses mostly but also within top categories. Interior designers should take inspiration for pillows, drapes and upholstery ideas and urban clothing lines should follow suit on tshirts, denim and tennis shoes. Luggage and large accessories such as totes and carryalls will also be seen using this Pop interpretation of classic photography.